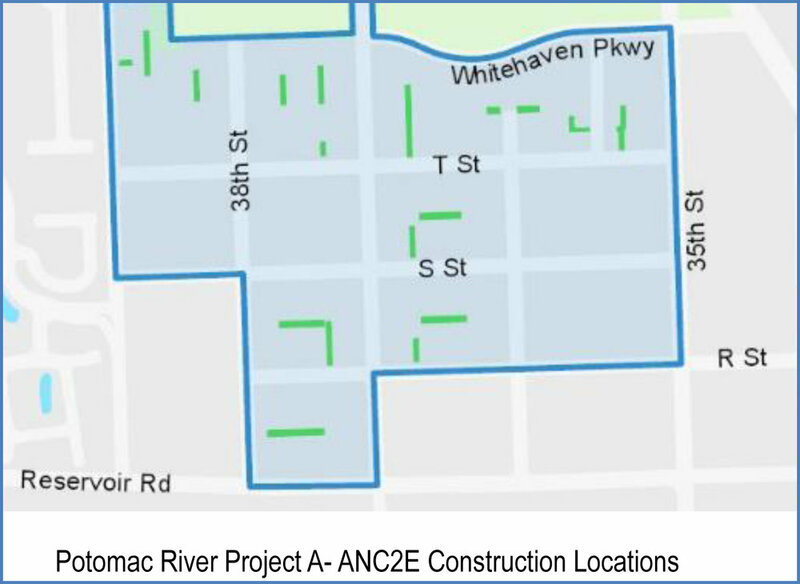 The Clean Rivers Project is DC Water's ongoing program to reduce combined sewer overflows into the District's waterways—the Anacostia and Potomac Rivers and Rock Creek. The project is a massive infrastructure and support program designed to capture and clean water during heavy rainfalls before it ever reaches our rivers. This post has been updated since its publication in June. Because of delays due to rain, work in Burleith is expected to begin in October, per Amanda Zander, Green Infrastructure Public Outreach Coordinator & Private Space Implementation Coordinator, DC Clean Rivers Project. They will notify ANC 2E and the residents in the vicinity of the work before construction begins. The DC Clean Rivers Project began installing green infrastructure (GI) in Glover Park in July, and will start work in Burleith in October. The work is part of Potomac River Project A, which is intended to reduce the level of pollution produced by combined sewer overflows into the Potomac River. At the June 4 ANC-2E meeting, Seth Charde, program manager for GI construction at DC Water, said that Burleith will have 19 alley permeable pavement facilities (aka green alleys) installed in nine alleys, while Glover Park will get green alleys, parking lane permeable pavement, and bioretention (rain gardens). Permeable pavements allow stormwater runoff to infiltrate through the pavement and into the ground and slow it down before it enters the combined sewer system. Bioretention captures and cleans stormwater runoff, allowing it to infiltrate into the ground and slowly release any excess into the combined sewer system. Click here for his presentation. Initial general notifications will go out 1–2 weeks in advance of construction start, with a door hanger reminder for the alley projects 2–3 days before actual construction start. The no-parking signs will be posted 72 hours in advance of any parking closure. Construction duration on the alleys is roughly 3 weeks for the small alleys and up to 6 weeks for the largest alleys. The work is phased to maximize access to the adjacent homes with typically only the legs of the alleys that are in active construction being closed. Construction will be conducted between 7 am and 7 pm, Monday through Friday, with Saturday used as a weather make-up day. If trash and recycling are collected in your alley, bring your trash and recycling bins to the front of your property until the alley is completed. If your bins are too cumbersome, use thick trash bags. Sonya Chance, DPW’s lead solid waste inspector for Burleith, attended the June ANC meeting and is aware of this activity. Amanda Zander and Lilia Ledezma, who handle DC Water’s outreach for green infrastructure construction, staffed a table at the Burleith picnic on Saturday, June 16, and answered questions about what’s planned for Burleith. For more information, contact Ms. Zander at (202) 787-4142 or cleanriversgi@dcwater.com. All 43 facilities planned for Burleith and Glover Park can be found on the project’s interactive map on the project website’s homepage. Screen shot of interactive map on the project website’s homepage.